Fourty years have gone by and Rosi’s bar is still there with the same furniture from the past. For me it’s the best espresso in the area, still served in the same tiny little porcelain brown cups that have been used for many years in most Italian’s regions. Once, workers would use this spot as a kind of community center in which to play cards and drink farmer’s wine. 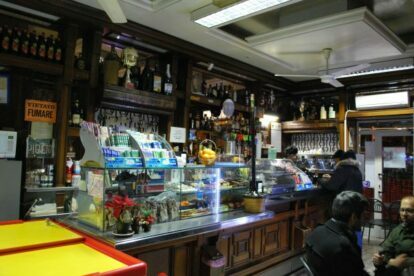 Now, it’s well-frequented at night, not only because it has the cheapest prices of all the bars in Isola Pedonale Pigneto, but also for its personality. It’s a family bar. All the staff are relatives to Rosi, and you will be sure to be among locals there. Another interesting thing I appreciate in Rosi are the old pictures hanging on the wall where you can see Pigneto in the ’60s, famous Roman actors and singers passing by and an old picture of the entire Rosi family. I recommend this place because it’s a jump in the past. If you have the chance to talk to Rosi, you will definitely talk to a piece of Rome’s history.